Chuan Lao Hui Pixian Douban (川老汇郫县豆瓣）：He thought this one was ‘ordinary, OK (一般)’. He preferred the ‘red oil chilli bean sauce’ （红油豆瓣）produced by the same company, although he wasn’t wildly enthusiastic about that either. (The ‘red oil’ version does, however, contain various extra ingredients, including sugar, MSG and spices, while the regular version contains only chillies, broad (fava) beans, salt and wheatflour. Non-Chinese speakers will be able to recognise it because the pot is the same distinctive shape, but the sauce itself is a lighter red, and oily). The regular Pixian paste is also available in plastic packages (picture below). But where can I get “Sichuan Dan Dan Seasoning Co Ltd” in Europe? Liuzhou Laowai – what shocking news! Lee Kum Kee have obviously been tremendously successful in marketing their products in Mainland China. When I was first learning to cook in Sichuan, I never came across the brand. 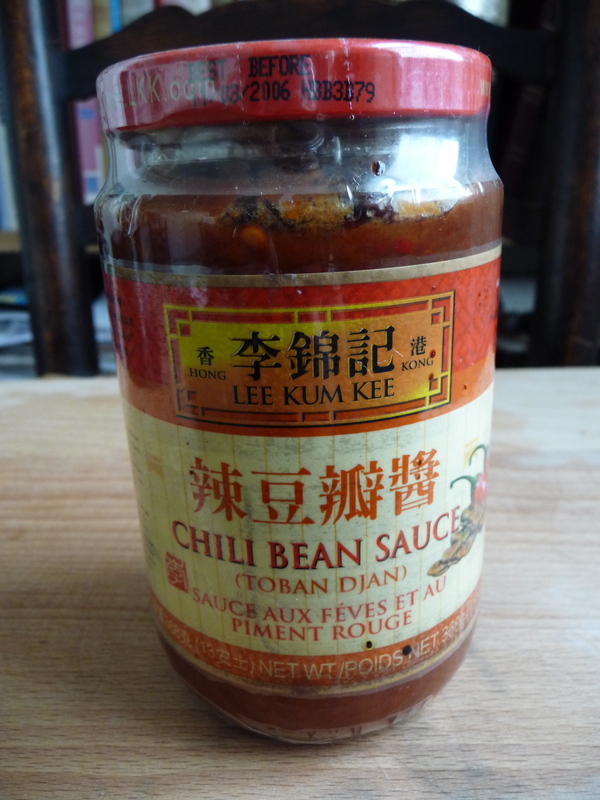 A few years later, Lee Kum Kee sauces of various kinds were popping up in many kitchens, high and low. 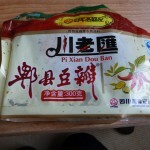 I have not seen the sichuan Dan Dan product in New York or New Jersey. The lee Kum lee product is i believe readily available and the Chuan lao Hui in its distinctive shape bottle can be found in Chinese Supermarkets. I prefer a product called Pixian Seasoned Bean (also called Pixian Thick Broad-Bean) which is available in New York in a soft plastic container from Chengdu Xin Hong Wang Company (is this a well known company in sichuan?) ; the listed ingredients are in order Chili, broad beans, salt, wheat flower and potassium sorbate. There is also another product ,which i haven’t used yet, available in a clear plastic with the identical ingredients but aside from the words Super Lucky, everything else is in Chinese, so i can’t make out the manufacturer. I’ve used the Pixian Seasoned Bean very successfully ( i think ) in Fuchsia’s recipes. It’s a shame the Lee Kum Kee is the most readily available. Last time I bought it I thought it had too many chilli skins in there. The best one I’ve found here in Canberra (Australia) is <a href=”http://www.progressivedinnerparty.net/2009/07/06/indulgence/comment-page-1/#comment-2119″this one which gives ingredients as “broad bean, chilli, flour, salt” and has JuanningDouban” on the label. Stuart – the ingredients sound promising. And some of the coarser pastes are sold with whole half beans and very large pieces of chilli in them. When I was learning to cook in Sichuan most pastes came like this, and we had to chop them to a puree with our cleavers, on a wooden board, before we used them. (If you are chopping a reasonable quantity, you could do this in a food processor.) Nowadays, most pastes are sold in a finer version so you can use them straight from the jar – I presume they ferment them whole, and then process them to a paste before packaging. I’ve been on the Pixian chilli broad bean paste hunt for years and always kept an eye on the stores to see what they stock. 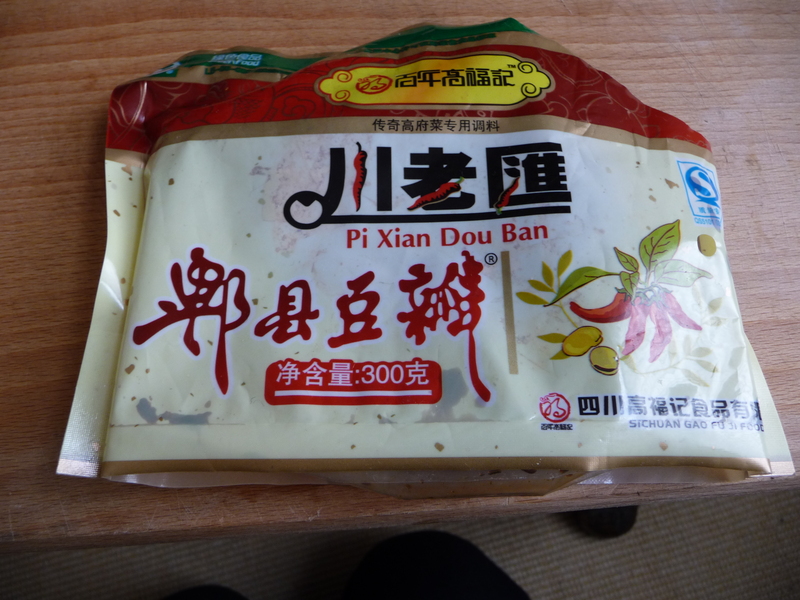 Here are the varieties of Pixian chilli and broad bean paste I came across in the past years, and here is a website comparing brands [google translate]. As of late, it seems the real stuff from Pixian is disappearing again from the stores. Fuchsia Hello, I live in Minsk (Belarus), today finished reading your book on the Russian edition, it’s great! Thank you for your work! I work as a cook and I am very interested in Asian cuisine, but so far only theoretically. I also love to hitch-hike and hope to make their great culinary journey. Hi Vladimir – I’m an American who spends a lot of time in Shanghai and I’m also a big fan of Fuschia’s books. I’m going to be in Minsk in March. Perhaps I could bring you some Pixian Chili Bean Paste from China in exchange for helping me to find a good place to eat in Minsk? Hi Vladimir, it’s lovely to hear from you, and I can hardly believe that my book is being read in Belarus, in Russian! So thanks for your message. And I am v amused by the idea that this blog might become a place for people to exchange tips on hot restaurants in Minsk! Hello Fuchsia, thanks very much for the tips. I use Toban Jhan chilli bean paste by Amoy. It has 44% chilli, 6% fermented salted soy beans, and salt, water, soy sauce, suger, flavouring and “flavour enhancer E621”. Not perhaps enough beans (and not broad beans), but this is sometimes available in supermarkets in the UK. Could you do something similar for Sichuanese dried chillies? The Cool Chile Company you name in your great book “Sichuan Cookery” no longer sells them. I only have occasionally found them in one of the Chinese supermarkets on Gerrard Street in London. Hi Fuchsia, great infromation thank you. ALways wonder what production standards for food stuff are in China. Would it be possible to make the ‘basic’ sauces (also hoisin etc. ) yourself and up the quality? Bit of a shame nobody sells good stuff via the internet. Went into the local Asia shop today to buy some fresh tofu and chilis and BANG there was Sichuan chili bean paste on the shelf. Of course I did not dream of being able to purchase this stuff so easily in my little midGerman town, but alas I was lucky. The stuff comes from V.R. China (the real thing), imported by “Tainkimheng Germany” (they do have a website). Apparently if judged from the label in greater quantities produced factory product. Ingredients: vegetable oil, wheat flour paste, beans (not specified), chili, salt, unfortunately benzoate and sorbate (from the wheat paste) plus MSG. Very oily, deep brownish red, texture fine, not coarse. Smells good, tastes good (although I can`t compare with the other Sichuanese bean pastes). Can`t translate the (chinese) Kanji though. In the first place I went to the shop to buy korean chili flakes to make korean chili paste (gochujang). (I cannot convince my wife to eat the regular korean chili paste which she finds too stinky). This generated the idea to ask: … … Fuchsia, (or somebody else), you would not be able to accidentally coax the recipe to make a basic sichuan chili bean paste at home out of a friend who commissions this stuff? Or look it up in a chinese sichuan cooking book? Of course, only for the real aficionados?? (I would be willing to trade in the korean recipe, but since it is pretty much public, this is not sooo good a bargain). 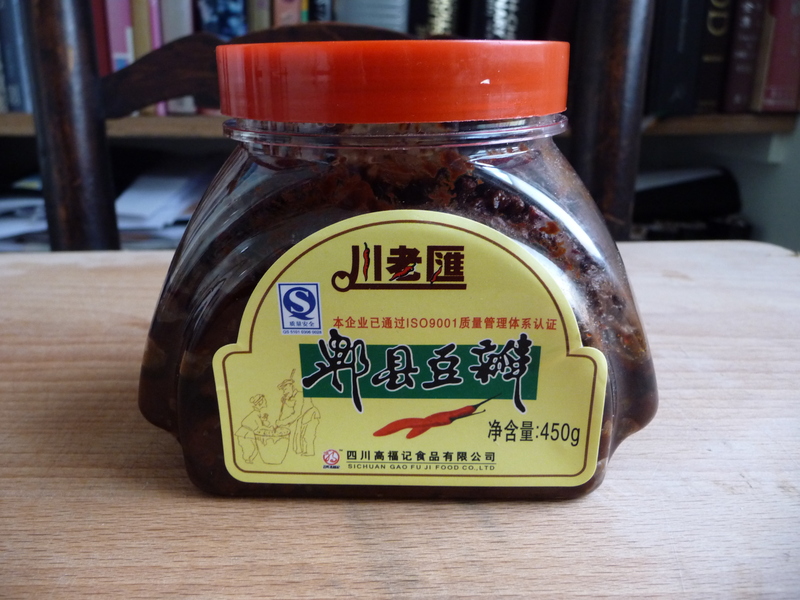 I found jars of Sichuan Dan Dan Seasoning Co douban jiang by happy accident a few weeks ago. I was trying to find something more pungent and true to the taste of douban jiang than what I could get out of the LKK version. I have to say it is much better (though of course, not quite like what you can source in China). It’s available at See Woo Hing Supermarket on Lisle Street in London Chinatown. It’s the supermarket that has the green & gold theme. I didn’t find it in the sauces aisle, but rather on the shelves above the freezer items next to some vinegars and cooking alcohol. Just keep an eye out for the wicker basket. 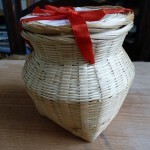 Also, there is no jar inside the wicker basket! The sauce comes in a plastic bag and you have to find your own jar for storage. This past fall I took a cooking course at a Chinese trade school in Shanghai. I noticed that the chef would spend about several minutes chopping the paste before using it (someone mentioned this above) and he also warned that it’s easy to end up with an over-salty dish when using it. He recommended that you limit or eliminate other salt in the dish, and add a bit of sugar to counter the saltiness. We were also told that as a general rule, the cheaper brands of chili bean paste are saltier. I’ve come to think of genuine Pixian chili bean paste as the secret ingredient for fantastic Sichuan food, but at the same time I’ve found that it can make a dish way too salty if you’re not careful. For my humble Sichuan cooking experiments I used 3 different brands of douban jiang until now. The first one was the hot bean sauce by Yeo’s (a company from Malaysia). The second one was Lee Kum Kee product mentioned above. The third, last and best one was an native sichuanese douban jiang from Pixian. I read once, this city is well known for the best douban jiang. Unfortunatly this one was only available for a short time in the asian grocery of my choice. It was indeed darker than the Lee Kum Kee product and had a stronger flavour. Astonishingly the Yeo’s product was much closer to the original in colour and flavour, although it is made of soy beans instead of fava beans. Meanwhile I saw one or two other brands in the asian grocery, but I didn’t test them. For my red-braised beef from your “Land Of Plenty” last weekend I used the douban jiang by LKK. By the the way: One of the best – if not the best – chinese cooking books I own. The best sichuanese one anyway. Thank you! I have been substituting this sauce for Szechuan chili paste in the recipes – am I changing the flavors a lot by doing so? Is it possible to make one’s own chili paste? We have ready access to Chinese and Korean dried chilis. Have you run across any recipes that you could share? I’ll echo the common sentiment here that your books are incredible resources. Thank you very much for sharing your knowledge! Thanks for your informative post. I’m endlessly browsing the aisles of bottled sauces and condiments of the Chinese markets here in San Francisco, and it’s very rare to find a good brand of hot bean sauce. I’m also interested in making my own, but I haven’t been able to find a recipe. I’d be grateful if you have any information you could share. Bruce, Brian-the cookbook Classic Chinese Cookbook-by Yan Kit So ( included in the bibliography of Fuchsia’s Landy of plenty), describes a home preparation of Sichuan Chili Paste-grind “sufficient” chili peppers in a food processor or mortar and pestle and mix with yellow bean sauce (assume one with broad beans). She mentions a starting proportion of 1 tablespoon chili to two tablespoons bean sauce (mild version). Hope this helps or begins discussion. Excellent post on chilli bean paste, which I am now slightly unhealthily obsessed by thanks to your book! I can confirm that the Sichuan Dan Dan Seasoning Co and its attractive basket have made it to Manchester and now into my cupboard (I actually thought it was the Pixian brand, just in a special package). Incidentally, whilst in Chengdu last year I tried to arrange a visit to the Pixian douban factory, in a sort of weird pilgrimage. As I can’t speak Chinese, I asked the receptionist at my hostel if she could call the factory for me and ask (after a few weeks of miming your way around China you tend to lose your embarrassment about making such ridiculous requests of people!). Sadly it seems the factory doesn’t accept visitors…but I would have kicked myself if I hadn’t at least tried. Did you actually go there one time Fuschia, or am I imagining that? More successfully, I did visit the “Cookery Museum” outside of Chengdu which features a restaurant where you can order dishes and watch them cooked in the kitchen from behind a glass screen. Having learned what little I know about Sichuan cookery by experimenting in my flat with a teflon wok and various items retrieved from Chinatown, I found this absolutely fascinating and would highly recommended it (despite the trek to get there). I also got to try my first rice crust…it was just a shame I couldn’t eat (and therefore see) more! It also occurs to me now that they had a very large special “menu” of many Sichuanese dishes with their names in both Chinese and English, which I begged to be able to photocopy. I think it might be the standardised menu that got circulated around the time of the olympics. Has anyone seen an online version? Graham- we will be in Chengdu in March for a two week cooking program at the Sichuan Institute for High Cuisine; would be interested in a side trip to the “cookery” museum , can you provide any details on location, etc? Is there any reference on internet? Yes, I did visit the Pixian doubanjiang factory many years ago! I think I was very lucky to be allowed in – as far as I can remember, the initial answer was no, but eventually they relented. I wrote about the place in my Sichuan cookery book, I think in the introduction to the recipe for fish braised in chilli bean sauce. I don’t think the Sichuan food museum would be using the Beijing Olympics menu – I had a copy of that and don’t think it was that strong on Sichuanese and other regional dishes. As for the translated menu, I’ll scan and put up online when I get time, then post here about it. It may be of value to other non-Chinese speakers visiting Sichuan. I only acquired it pretty late in my trip, sadly. I have to say that I found not knowing the language could lead to quite disappointing restaurant experiences, especially in more formal places, (a good reason to learn Chinese if ever their was one!). Of course I got a fair amount of mileage from the random “point and pick” method! On the whole I had far more success with street-side or small-restaurant eating, where you could often see the produce and choose something you hadn’t tried before. The food seemed far more like home cooking, but that was generally no bad thing. I agree that it’s difficult to order well in Chinese restaurants without knowing the language – that was what spurred me on in my studies in Chengdu! I used to beg restaurants to let me photocopy their menus, and then sit in a teahouse with a dictionary and learn the characters. Graham – someone else asked me recently why I hadn’t included tonal markings in my books.I suppose it’s mainly because they look messy, and are only helpful to a very small proportion of people who know a little Chinese but can’t read characters. If you can’t speak Chinese at all, it’s quite hard to pronounce the pinyin in a way that is comprehensible to someone Chinese, with or without the tonal marks. And if you are beyond a certain level with Chinese, chances are you’ll be able to read the characters anyway. But I do recognise that it’s annoying for people who are starting to learn! I suppose if I’d intended the Sichuan book to be used as a guidebook, I’d have thought more about it, but when I wrote it I had no idea that people would start showing up with it in Chengdu and using it to sniff out dishes in local restaurants! I’m sorry if you find it frustrating, anyway. Fuchsia-the conversation here refers to “The” Pixian Chili Paste Factory -is there only one in the Pixian area? The labels on products i’ve seen give different manufacturers but perhaps they are all subs of one. …and also this video, which is set in the museum itself. Don’t worry, there were no dancing people eating chicken when I visited (though the two ladies who showed us round were quite entertaining) and in fact the museum itself was reasonably austere. I didn’t get that much out of the exhibition part (some nice vegetable fermentation pots not withstanding), but being able to see professional chefs at work in the interactive demonstration hall really amazed me. So much skill, speed and invention with the minimum of tools (cleaver, wok, ladle – that’s it!). This is what is so inspiring about Chinese cookery, I think. If you’re doing a course at the Sichuan Higher Institute you will see (and try) much the same as in the hall, though it will give you a chance to try more dishes and see them being prepared and cooked. The bit around 2:53 gives you an idea of what to expect anyway. In case it isn’t clear from the above, the museum is in Pixian county, not in Chengdu itself – so if going by public transport from Chengdu you should definitely take a full day out to get there and back (journey took at least an hour from Chengdu centre, plus additional time to find the right station). This is the only thing that stopped me revisiting the day after! Graham- thanks for your very helpful information, perhaps we should take further discussion offline so we don’t clog up fuchsia’s blog. My e-mail is mel.winokur@gmail.com ; if you write to me i’ll provide you with all the details. It’s really flavorful, but is labeled as Pockmarked Grandmother’s Beancurd Seasoning rather than chile-bean paste. The ingredients list broad beans (not soy), chili, rapeseed oil, msg, then ginger and garlic. I’m assuming the addition of the last two ingredients is the difference between this and regular chile bean paste? The first thing I made was mapo tofu (last night). Tonight I made dry fried green beans and a fish fragrant dish with fried leftover tofu and bok choy. Delicious. This is such an amazing cookbook. I write a food blog, and will almost certainly document about some of the delicious Sichuan dishes I plan on cooking. I hope you will take a look. Thanks again. Well finally, as promised, I managed to scan the document I got hold of at the Museum of Sichuan Cuisine in Chengdu, which provides translations of a great many Sichuanese dishes and cooking styles. At 43 pages it’s quite extensive! The official title is: “English, Japanese and Korean Translation of Sichuan Famous Food and Famous Snack”. I hope this can be of use to non-Chinese speaking visitors to Sichuan when trying to order regional specialities. Would be interested to hear your comments as well Fuchsia. I’d be particularly curious to know who produced the document in the first place. Perhaps with some Chinese-search-engine skills an original version of the document could be unearthed online? To my taste, the 3rd (Chuan Lao Hui Pixian Douban) is superb in contrast to the 2nd (the widely available Lee Kum Kee), which I find so over-salty that it’s unusable in the quantities suggested in Fuchsia’s recipes, and also lacks depth of flavour and colour. I have seen the 1st on my travels and was a fool not to buy it; when I returned a few weeks later, the store (in Manchester) had sold out. Hi Fuchsia and everyone else ….. I followed Fuchsia’s ‘Land of Plenty’ recipe for Red cooked beef with White Radish many years ago and I regularly cook it still. When I do cook it now, though, I employ plenty of my own personal modifications but the essential of this dish is the ‘doubanjiang’ taste. Regular old Duolajiao, which I make on a frequent basis (see Fuchsia’s ‘Revolutionary Cookbook), just doesn’t fill the bill here, nor do any other chili pastes… Thus I have recently been reduced to trying to synthesize it myself…. Oh, BTW Fuchsia… I have now reviewed all three of your great books on Amazon. @Michael Zehrer, hope you read this. 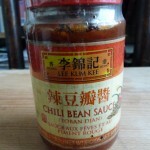 I have been on a hunt for Pixian Chili Bean Paste for a while in London. Gerally the Lee Kum Kee one is all I can find but I found one made from fava beans (broad beans) today so am going to try that. I found it in the little store opposite Boazi Inn away from those on Gerard Street. I live in rather remote Nova Scotia. Until a year or so ago the only chili bean paste available was LKK which is, frankly, quite awful. In my city there are now so many brands available – no doubt sparked by Fuchsia’s books – that one has to buy every one to test them. Obviously if they don’t contain broad beans, flour, chilis and salt or they contain other ingredients I don’t bother with them. I am down to two brands as Dan Dan is not to be found here. The first is untranslatable by me but they have a site http://www.chuanpi.com – it does not list chilis as an ingedient but they are obviosuly there. I use it only in tiny amounts to add extra zip and to work my way through the bottle (I will not re-purchase this one). It smells good but doesn’t have enough character and is overly salty. My favourite to date is again untranslatable but they can be found at http://www.pxdb.com It seems to have alot of character but then I can’t really compare it with the best never having had the good luck to find or taste the ultimate. 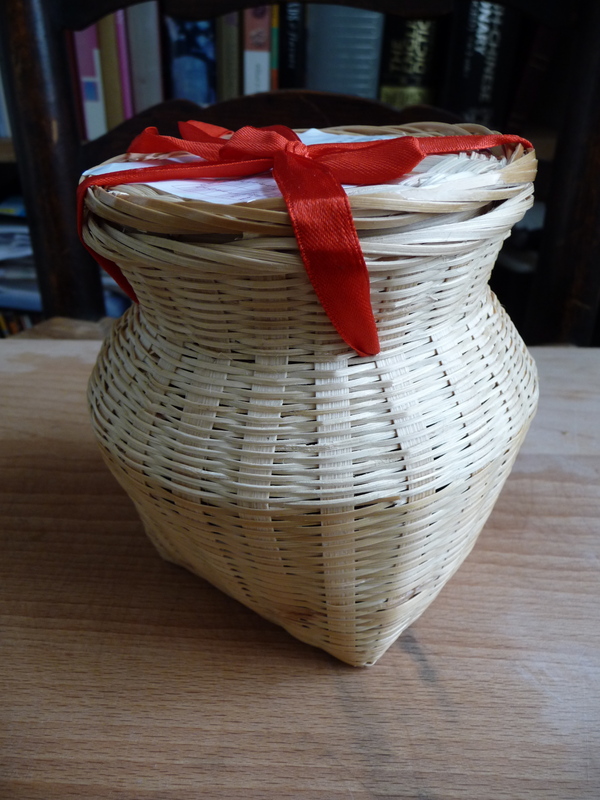 This one comes in a squarish plastic bag, wrapped in brown paper and tied tightly with jute twine. It certainly builds up a wonderful array of aromatics as it is being fried. 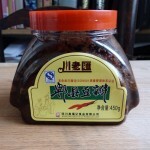 I wonder if anyone has compared it with Dan Dan’s chili bean paste? Fuchsia, can you give us some of the precise characteristics we should look for and smell / taste in a great chilk bean paste? In 2009 we were in London on a hunt for Sichuan chili peppers. We walked for hours through Chinatown and finally found them at 28-29 Newport Court WC2H 7JS (02074949222) and whose card says “Supermarket”! Sadly the seeds from these did not sprout so they must have been very old. When we got home I walked into a Chinese grocer just down the street – they cater to college students so I had always avoided it – low and behold there were stacks of Sichuan Chilis. The seeds sprouted successfully. Last August a fellow in North Carolina sent me some seeds. Of note he says “when the seeds sprout, if the cotyledons are green they are the Sichuan chilis, if they are pruple they are hybrids and you may want to destroy those ones. You should get both”. I should mention at the same London shop I bought Chuan Lao Hui Pixian Douban in that strange jar Fuchsia shows (above); I have to agree it had very little character. John T. – my favourite CBP also comes in small tinfoil envelopes. I can send you some if you send me your email. I can just imagine your desperation up there in the Arctic! Now my quest is better Sichuan peppercorns. A local chef brought some back from Chengdu last spring, they left your tongue tip/cheeks/lips feeling as if you had your finger in a light socket. So I know what I want, I just don’t know a fine brand that I try to find. Better sign off as I find myself dipping chips (aka crisps) in the chili bean sauce by my side! that was a super kind offer but I have been able to obtain LKK here in Iqaluit not long ago and I will be going to Ottawa either just before the December holidays or else just afterwards. Do you know Ottawa at all? There are a good few blocks out on Somerset st. West with decent Asian groceries and restaurants. I’m going to check out what I can find there and will post the results here if anyone wants. John – I’d love to hear what you find in Ottawa. Keep us posted and get the address if you spot any from Dan Dan! Is the Sichuan Dandan Condiment Ltd. the same as the Sichuan Dan Dan Seasoning Co Ltd? I found other products by the former at a local Chinese grocer. This leads me to believe the owner may by able to bring in the chili bean paste that Fuchsia recommends IF it is the correct company. Apparently they have a top of the line 7-8 year old brand but I can’t decipher which it is. So I live in Hawaii and buy Pixian Douban in pouches from a local asian grocery. There are three different kinds a regular one in a red pouch, another one in a white pouch that has oil added, and a supreme grade. They all list chilies, broadbeans, and salt as the only ingredients except the white one which has oil. It is very tasty, I like it better than LKK. I was surprised at how large the chili pieces were and some large broadbeans as well. Haven’t opened the supreme grade yet maybe it is finer. The manufacturer is listed as being in Chengdu. I think the exporter is Green Foods or something. Does anyone else have experience with this? Brad – I too was surprised at the large pieces of chili and the whole broadbeans. Are we meant to crush these when stir-frying? I even contemplated pureeing a batch to see if I could extract more flavour. Be great if you take a shot of the supreme grade packaging. Their site was down last time I tried. Actually the paste is made from whole split broad beans and whole chillies, which partially distintegrate as they ferment. When I was at the Sichuan cooking school, the bean paste we used was extremely chunky – so one of the basic kitchen tasks was to fine-chop it with a cleaver, to make it into a puree. It’s still often sold that way in Sichuanese markets, although I think the versions you buy in sachets, especially in supermarkets, will be pre-chopped. So yes, if you buy the chunky sort, you do need to mince it before use – with larger quantities, you might use a food-processor. If you’re just chopping enough for one mapo doufu or something, a cleaver is fine. Fuchsia- Thank you for the response I have been using the chili bean paste without out chopping and the flavor seems fine but sometimes there are whole peppers in my ma po. John- I was not aware they had a site I have tried searching for Green Foods online but either there isn’t a website in English or I have the wrong name. What site are you referring to? Brad – As mentioned earlier http://www.pxdb.com It is back up but http://www.chuanpi.com is still down. I love your Books, Land of plenty inspired me to spend 6 months as a prep cook in a sichuan restaurant here in eastern Washington (spokane). We have two asian markets in town one primarily vietnamese and thai, the other korean. It has been exceedingly difficult to get sichuan ingredients here in spokane. The resturant can get things shipped from Seattle, but for my home cooking needs I am generally out of luck. Do you know of any online sources to get the good stuff? I would love to get my hands on some Pixian Chili paste, facing heaven chilies, dried salted chilies. the orientalpantry, and thecmccompany no longer have websites. and the pac rim site only has LKK paste. Do you have an updated online source list?